Primary woods tool: Hatchet/Axe or Machete? Discussion in 'General EDC Discussion' started by enki_ck, Sep 24, 2012. I've read and heard a number of times; Axe in the north, machete in the south. But why? what are the advantages an axe holds over a machete and vice versa? Which one would you pick? (And don't say both ) I know my choices and reasons but I wanted to hear your guys opinions on this one too. If we're talking about the CONUS (especially the eastern side)... In the North, forests are generally less dense and composed more of trees. 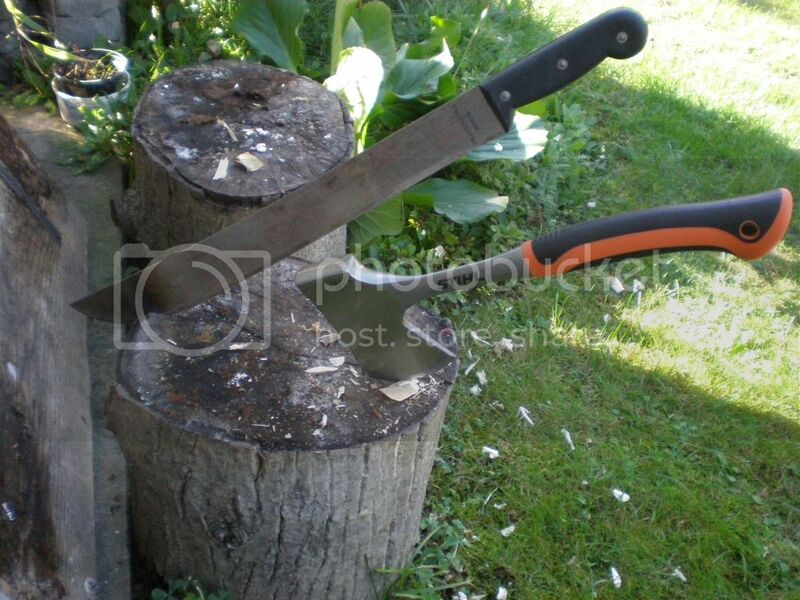 An axe or hatchet is good for chopping wood and splitting it. You will generally encounter thicker brush in the South. A machete is better for cutting brush. If we're talking more globally, the Artic is going to have harder woods and little brush to cut - you need an axe. In tropical jungles, much of what you need to cut is green and more easily cut with a machete. smokingfish, ManVsLawn, Sriracha and 4 others like this. Cannot get by without both: a machete for brush clearing only, Wetterlings hatchet for hardwoods. Lotsa oak & hickory around here; lotsa dense underbrush. ManVsLawn, enki_ck, IMWILSON and 1 other person like this. ManVsLawn and enki_ck like this. The North-South reasoning is based on the stuff you'll be cutting. In the South, the thought is you'll be dealing with larger qtys of lighter weight stuff: vines, saplings...etc. You'll be using the machete for trail clearing, cutting vines for cordage, maybe dispatching poisenous snakes, food harvesting/processing, and perhaps even defense. Up North its will be harder heavier woods, with a bigger emphasis on wood cutting for fire and shelter building. The machete can still be handy up North for trail busting. but as you go further North, low viney ground cover starts to dissapear pretty quick. I grew up stomping around woods in Kentucky and north of there, and a machete wouldn't not have done much good. Anything I needed to cut was a hardwood and the light weight of a machete would have made it unbearable. kdunnett, SurvivePenna, enki_ck and 2 others like this. I once heard the saying, "give a woodsman a knife and he can survive... give him an axe and he can thrive." As long as he's not in the jungle I guess! ac7ss and Gnarly like this. I guess jag-engr and amacman said it all, really. However, I do sometimes use a parang - a small machete or huge knife from Borneo - for gardening tasks. enki_ck, Gnarly and wildborego like this. In fl like the machete better, there's nothing big that your going to be cutting down. Palms and other small plants are the one the main things in your way. Beside the machete is light and can be easily be carried for hours vs a hatchet. Up north I guess the story would change, but i am down south so i am not really worried about that right now. just saying. I'm in new York. And the only times i've wished I had a machete were on a few canoe trips. Even then its only an issue if you want to go into smaller streams and off the beaten path. I've reached a time in my life that I don't like either one. Being a senior citizen, I go for a folding saw. Easier, safer, and works for both cutting and splitting wood for campfire. I go camping, and lumbering operations don't come into the picture. The saw works fast, is lift weight to carry in a pack, and doesn't make chopping noises. To me, quiet is good. Also, if injured, a saw can be used easier with one hand/arm out of action. For longer trips, a Sven saw and spare blade in the pack is lighter than a hatchet. Broken down, it fits in a tube. TDS, DBR, mole and 2 others like this. For solid wood you need to chop through, the axe will be the more efficient tool - a smaller weighted head will give you a more powerful swing, and because there is more material behind the cutting edge it will stand up better to the abuse of being sung at a relatively solid piece of wood better. For clearing brush and lighter weight, but more dense material, the machete will be the superior tool - it won't be able to chop through such thick branches as the axe, but what it can get through it will do more quickly and more efficiently - the larger blade means you can clear more in one swing, and the lighter weight makes for a more maneuverable tool when you are on the move clearing brush. There is of course the axe alternative in the form of the saw - for cutting through branches it can often be quicker and less tiring than swinging an axe, and are available in small folding models that are lighter weight and easier to carry than axes when hiking or carrying gear. A different use again - poor for bringing down a tree for example, but brilliant for cutting already felled wood. As mentioned above, in the US there will be a general North/South divide in which is most appropriate based on the most common foliage in the areas - more jungle based down South, more open forests such as pine in the North. I am not sure it really needs said, but both tools are enhanced by the addition of a smaller blade alongside them - a smaller folding or fixed blade for small scale and more delicate tasks - cooking, carving, cutting stuff like cord and all the other points where a larger tool becomes very unwieldy. Machete all day everyday. Love my axes, but they don't see a lot of use. tried machete, kukri, rifleman s hawk, folding saw during the last 10 years or so. folding saw is the most practical, kukri the most versatile (but you get strange looks when you reenter civilization....) i also tried other big and heavy knives (bowie et al.) but kukri style for me works best AND its somewhere in between machete and axe and big knife. Like sungame said, there's not much use for a machete in Scandinavian woods. I have one, but I don't think I've ever used it beyond trying it out. I prefer a sturdier Fiskars billhook for clearing brush or cutting branches off tree trunks, but I rarely do either. The bottom line is that with a machete, you can lop off branches, but with an axe, you can bring down the whole tree. looking at getting a Fiskars X7... thoughts? anyone own one? I have an X7 i use for making bigger kindling smaller splitting you will be surprised at what it will do. The X7 is my go to of all the Fiskars gear I have. I have the X5 it gets used for clearing along with the Fiskars brush axe. Used them last week to clear for a tree stand. The X5 is great for one handed small kindling and things like that. Also have the X11 and X17 splitters and the X15 chopper. Yes I like Fiskar. They take abuse, keep and edge and ask for more.